Aerial picture of the Caernarvon Freshwater Diversion outfall canal (on the right) and the delta built by the diversion in Big Mar Pond. The photo was taken on July 17, 2014. Note the lush, green vegetation on the newly built delta includes wetland grasses and black willow trees. All of these plants colonized on their own, once the diversion built the land. Within the scientific community, and among the general public, there is controversy over the effects that nutrients, introduced through sediment diversions, will have on wetland vegetation. The speculation is that increased nutrients, especially nitrate, will result in decreased root growth. With increased nutrient availability, plant roots will no longer have to “search” for nutrients, resulting in decreased growth. This results in fewer roots to hold and trap soil and organic matter, creating weaker wetlands. In addition, the increase in nutrients could benefit the bacteria that decompose organic matter, decreasing organic matter storage in marshes; and, therefore, decreasing elevation and soil strength. Alternately, increased nutrients could also result in increased root, shoot and leaf growth. This increases organic matter (dead or decaying plant material) added to the marsh as plants die or go into winter senescence. With the addition of sediment from the diversion and the organic matter produced “in house,” marshes have the ability to keep pace with sea-level rise and stay above water. Therefore, the increased production of organic matter could offset the increase in decomposition rates. A team of scientists convened to discuss nutrients and determine their effect on marshes and expected changes due to sediment diversions, and their conclusion was: IT DEPENDS! How plants assimilate nutrients can be highly species-specific and situation-specific. Some species, such as cattail and common reed, respond to nutrient addition as if it were a fertilizer and growth rates increase dramatically. Other plant species show a more muted response. How plants and ecosystems respond to increased nutrients can vary with a number of other environmental factors discussed below. Land building in Big Mar Pond over time. This delta was built by the Caernarvon Freshwater Diversion, which is supposed to avoid sediment capture. Despite this, sediment is transported into the receiving basin. The diversion began operating in 1991 and the first land building was observed in 2005 (24 acres). 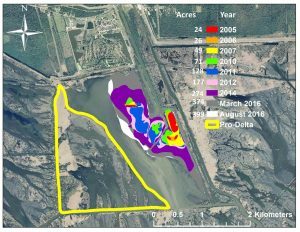 The delta has expanded to almost 400 acres by 2016. Environmental factors such as nutrients, flooding and salinity, individually affect plants and habitats in specific ways. However, when two or more of these factors are combined, they can have mitigating effects. For example, excess flooding or changes to the hydroperiod (frequency, duration and depth of flooding), can limit plant growth, especially in plants that are not adapted to flooded conditions. However, in some cases, the effects of flooding can be offset by elevated nutrients, which boost plant growth under flooded conditions. Another example is that plants growing in saltier environments may have reduced ability to uptake nutrients; but, as salinity decreases, the plants have a greater ability to uptake nutrients, boosting their growth. Therefore, as diversions shift nearby habitats from salt or brackish to fresh or intermediate marsh, plants will have more capacity to utilize the nutrients brought in through the diversion. Due to these effects, and the fact that hydroperiod, nutrient concentrations and salinity are all altered during diversion operation, it is often hard to determine the effects on an ecosystem of nutrient introduction alone. With the varied responses of specific species and habitats to nutrient addition and the difficulty in assessing the true effects of nutrients when other environmental changes are occurring simultaneously, what can we do to mitigate the potential effect of nutrients on marshes, introduced by sediment diversions? The answer lies in diversion operations! 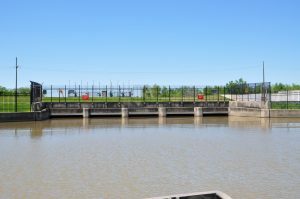 Caernarvon Freshwater Diversion: Five box culverts that pass water from the Mississippi River (behind the grass levee in the background) into the Caernarvon outfall canal. The diversion operates by gravity so that when the river is high enough and the culverts are opened, water will flow through without pumping. Recently, another group of scientists convened to discuss the effect of operating a diversion from many perspectives including hydrology, nutrient additions, sediment addition, etc. The result was a report detailing ideal operations to minimize negative impacts and maximize benefits of sediment diversions. To minimize impacts of nutrients on marsh vegetation, the report recommends operating the diversion from November through March, outside of the growing season. This operation strategy also minimizes impacts of flooding and lower salinity on marsh vegetation, oysters and other fisheries. By operating the diversion in the winter, plants are still in winter senescence and in a somewhat “dormant period” in which metabolic activities, such as growth and nutrient uptake, are at a lower rate. The same report found that operations during the start of the growing season, in April, should be limited as the excess nutrients and flooding have a greater impact on newly growing vegetation rather than well-established vegetation. Nutrient uptake by plants is greatest in the warmer months or during the peak of the growing season. During this time, short duration operation of the diversion during flood peaks will maximize sediment capture but minimize the impact of nutrients. In conclusion, although nutrients introduced by diversions will have some impacts on vegetation, the cost of inaction is higher. Without large-scale restoration that provides a source of sediment and fresh water, the delta’s wetlands will continue to degrade into open water. 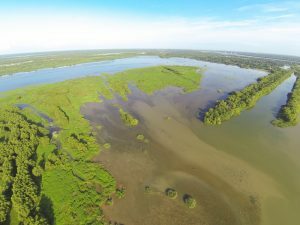 Any negative effects of higher nutrient input are outweighed by the larger restoration benefits for the entire coast, and most can be mitigated by proper and adaptive management of diversion operations. This is part 3 of our ongoing series where our experts will answer 10 fundamental questions with new and updated information, so that reasonable and scientifically-sound decisions can be made about the long-term sustainability of the delta and surrounding ecosystems. View an introduction to this series and our first post about sediment.